We’ll be the first to admit: we cannot get enough shine. You name it, metallic, glitter, sparkle, foil, we love it all. Thankfully, we’re not alone in our obsession. Beauty and fashion brands are focused on giving us exactly what we want. They’re pushing boundaries to come up with the most dazzling finishes that are so bold we can see our reflections in them. Metallic and foil finishes are up there in terms of prismatic appeal, but a holographic look is the ultimate for those seeking next-level shine. Holographic makeup has been #trending for a few seasons thanks to the way it captures the light and allows us to achieve a multidimensional effect using only one product. Fashion is definitely not being left out. 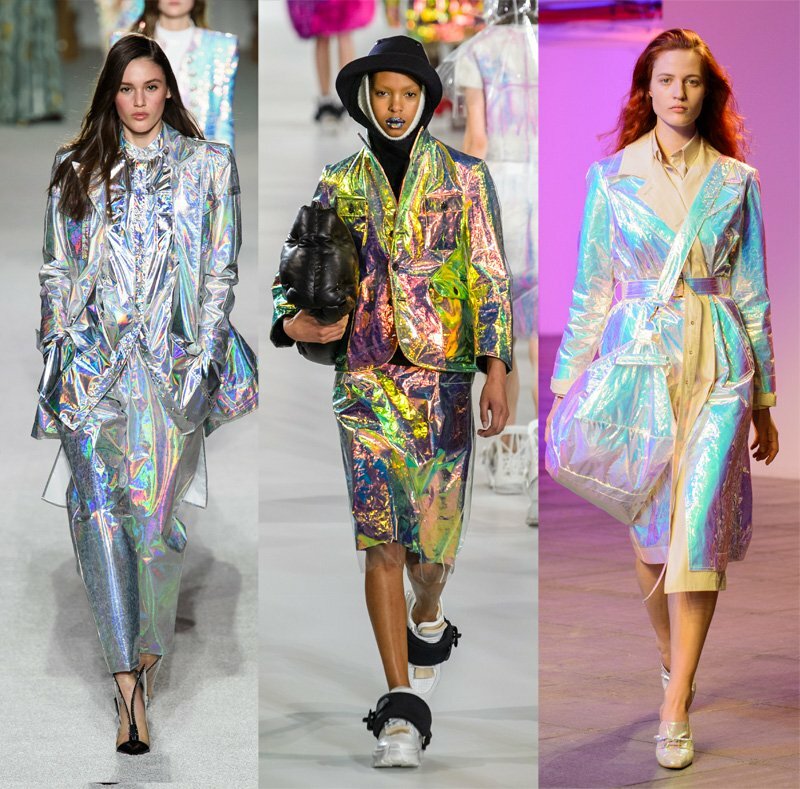 Metallic clothes and accessories have long been a staple but holographic fabrics have started to appear on the runways alongside our favorite foils and metallic finishes. With so many prismatic options, the terms are sometimes used interchangeably, but shine lovers will be able to spot the difference between a holographic design and its shimmering cousins. Holographic styles have a rainbow iridescent swirl in their reflective fabric, whereas metallic and foil finishes tend to have one shade. No offense to metallics, but the traditional fabrics just can’t compete. Iridescent designs were perfectly demonstrated on the Fall 2018 runways with Maison Margiela sending models down the runway in a myriad of prismatic looks accented with iridescent glitter lips. Balmain gave suits a space-age upgrade with dazzling holographic fabrics. Not to be left out, Sies Marjan, Maryam Nassir Zadeh and Area all worked high-shine fabrics into their collections. It’s not just the latest presentations at fashion month that have championed iridescent clothes and accessories. The rainbow sheen was spotted in street style looks in various guises (sneakers and bags being popular options). High street brands are also producing holographic pieces that have as much opalescent sparkle as designer versions, proving it’s not necessary to drop major cash to nail the look. Shop 16 holographic pieces that will transform your entire wardrobe. They’re so bold, you may need sunglasses.